On 19th of June during the magnificent final concert "Precious Stones" in Latvian National Opera the winners of the 4th International Jāzeps Vītols Competition have been determined. The winners are Marcelina Beucher, Margrethe Fredheim and Hayk Tigranyan. Jury has noted that the overall level of the competition was very high, however, the three winners are bass Hayk Tigranyan who took the 3rd place, Margrethe Fredheim is the 2nd and Marcelina Beucher who was titled the winner of the competition. It was decided not to award a Grand Prix. A special award and a diploma for a promising young singer was given to the 21 year old Armenian tenor Tigran Ohanyan. The award for the best interpretation of Jāzeps Vītols song by a foreign national was given to Armenian soprano Qristine Safaryan. The award for the best interpretation of Jāzeps Vītols song was received by the only Latvian finalist baritone Kalvis Kalniņš. Latvian Ērika Apeine and Armenian Jelena Vardazaryan were awarded as the best accompanists of the competition. The competition was supported financially by the State Culture Capital Foundation, Riga City Council and the Ministry of Culture, but the money awards were provided by the Boris and Ināra Teterev Foundation. The remaining EUR 500,00 was not awarded to anyone. 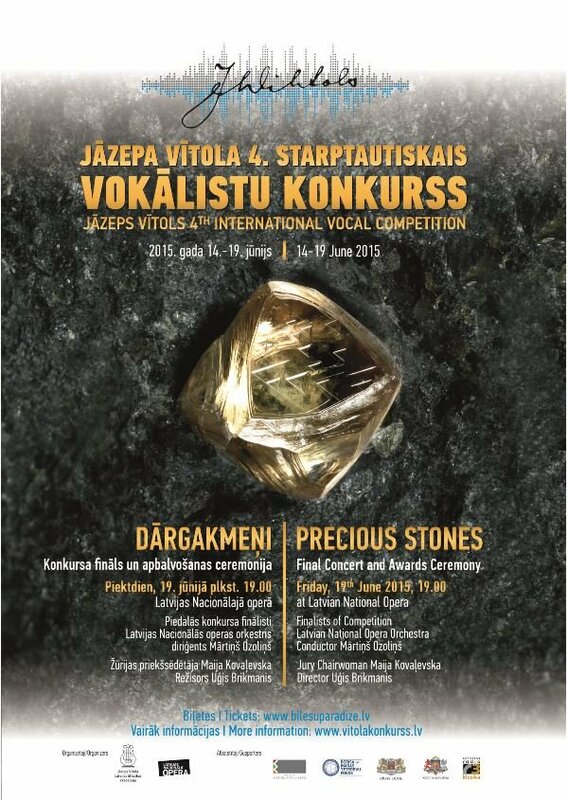 Precious stones has been chosen as the symbol for the 4th international Jāzeps Vītols Vocal Competition. It is a tribute to the fact, that each participant stepping on the stage - both in the first round, as well as the final concert taking place in the Latvian National opera - is an astounding treasure, which has been developed into a jewel during daunting year long trials. You are welcome to be present when new opera stars are born in Jāzeps Vītols Academy of Music and Latvian National Opera! To sustain the development and growth of the vocal art traditions in Latvia, Jāzeps Vītols Latvian Academy of Music organizes Jāzeps Vītols 4th International Vocal Competition from June 14 to 19 of 2015. The competition is an important professional event in Latvian opera singing and provides a platform for international evaluation of the field, experience sharing, motivation of young singers and forming of new artistic relations. The competition confirms the highly developed singing traditions in Latvia and is amongst the key international cultural events. The competition coincides with two international events that take place in Riga and are related to vocal arts. In the beginning of June the Latvian National Opera will invite many local and foreign admirers of opera music to its annual Opera Festival, while from June 18 to 21 Riga will host the congress of the European Vocal Teachers’ Association Eurovox2015 . Singing teachers from the whole Europe will attend the congress, therefore ensuring the presence and attention of a great number of professionals at the vocal competition. Singers, born no earlier than June 15, 1982 (female) and June 15, 1980 (male), are eligible for participation in the competition. The competitor must be at least 18 years old. Application deadline: March 1, 2015.